I really, heartily recommend this specialized piece of kitchen equipment if you like baking cakes, and like me, often break them while trying to move them. This cakelifter, from Nordic Ware, is pure genius. It's heavy, sturdy and I bet it can hold any cake - although I've just tried it out once so far, on a very fragile almond paste-chocolate cake that nearly broke just from getting it out of the pan. Nordic ware has great stuff!! The baking moulds I have wll outlive me. Wow! 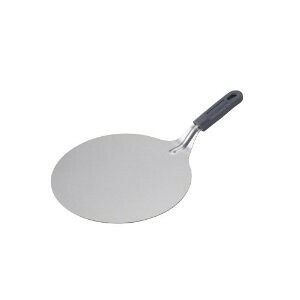 I have something that looks exactly like this (bought from an Australian homewares store) and it was sold to me as a "pizza lifter" - I've always used it to lift homemade pizzas from the oven pizza stone. But now, I can also use it for cakes! Thanks!